Large 3D imaging volumes are becoming more appealing both in cardiac function and whole heart coronary imaging, with applications in coronary imaging as well as cine or function studies. The transition from single 2D slices or small 3D slabs (e.g. 2–3 cm) to thicker 3D slabs (10–12 cm) is fueled by increased SNR and better image registration. However, for cardiac imaging there is an associated penalty that results from saturation of blood flowing into the imaging volume which can affect blood signal to noise (SNR) and blood-myocardium contrast. We investigate inflow enhancement (or lack thereof) in 3D cardiac single-phase imaging. Without modifying image acquisition or phase/slice encoding, we change the gradient amplitude during RF excitation, effectively changing the width of the slab that is excited by the RF pulses. By encoding the same voxel size regardless of RF slab thickness, the theoretical SNR remained constant between different acquisitions, thereby, permitting direct quantification of SNR associated with inflow. Since balanced steady-state free precession (SSFP) and gradient-recalled echo (GRE) sequences can both be used in large 3D acquisitions both were tested using four slab thicknesses, ranging from 3 cm (targeted coronary volume) to 10 cm (whole-heart volume). Twelve normal volunteers were scanned using a 1.5 T Achieva (Philips Medical Systems) and a 5 channel cardiac array. For each volunteer, an axial 100-slice 3D volume covering the heart was prescribed. A slice selective 3D acquisition was used with excited RF profile covering the entire imaging volume with an additional 20% width to remove the aliasing and imperfect slab selection. The acquisition was repeated 4 times with different RF slab encoding thicknesses (slab selection gradient amplitudes): 3 cm, 4 cm, 6 cm, and 10 cm. Typical imaging parameters for the navigator-gated, VCG-triggered acquisitions were: FOV = 270 × 270 × 100 cm, 2 × 2 × 1 mm voxels, 60° flip angle for SSFP and 30° for GRE. SNR was measured by drawing ROIs in both ventricular blood and myocardium regions. Noise was measured via ROI outside the chest wall. Due to long acquisition times, the images were prescribed with a lower spatial resolution to increase the chance of successful completion of studies in all subjects. Sample middle slice GRE (left) and SSFP (right) images are shown in Figure 1. These results show that there is significant inflow enhancement in thin-slab imaging for both GRE and SSFP. SSFP had higher baseline blood-myocardium contrast but lost it at a higher rate. With SSFP, approximately 6.1% and 4.3% of baseline SNR of arterial blood and myocardium, respectively, were lost per 1 cm increase in slab thickness (R2 = 0.995, R2 = 0.983, respectively). With GRE, approximately 11.2% and 8.4% of baseline SNR were lost per 1 cm increase in slab thickness for arterial blood and myocardium (R2 = 0.989, R2 = 0.984) respectively, up to slabs 6.5 cm thick, after which no further losses were observed. 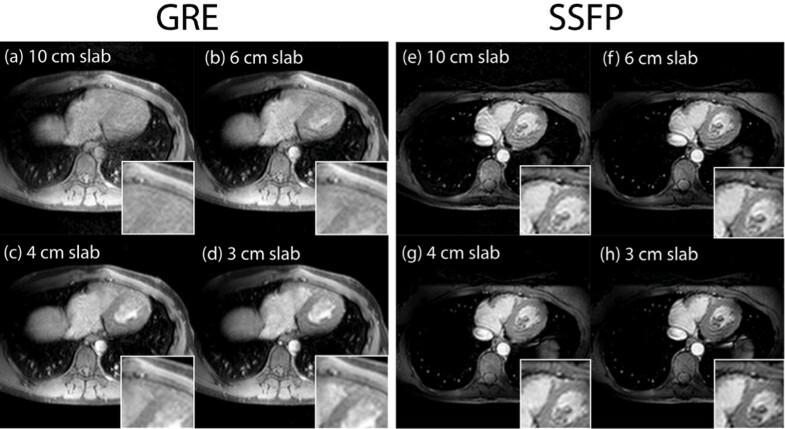 In the transition from thin slab to thick slab imaging, GRE shows more significant loss of blood-myocardium CNR than images with acquired with SSFP. As expected, baseline contrast was lower with GRE. CNR results and linear regressions are shown in Figure 2. 3D single-phase images acquired with GRE (a-d) and SSFP (e-h). The only difference between these acquisitions is the amplitude of the slab encoding gradient, resulting in no changes in SNR other than those introduced by inflow. Thicker slabs results in loss of blood-myocardium contrast for both GRE and SSFP. Contrast in non-moving tissues remains exactly the same through the four distict acquisitions. SSFP is less susceptible to contrast losses. Blood myocardium CNR obtained with GRE and SSP techniques. CNR decreases significantly with increasing slab thickness. 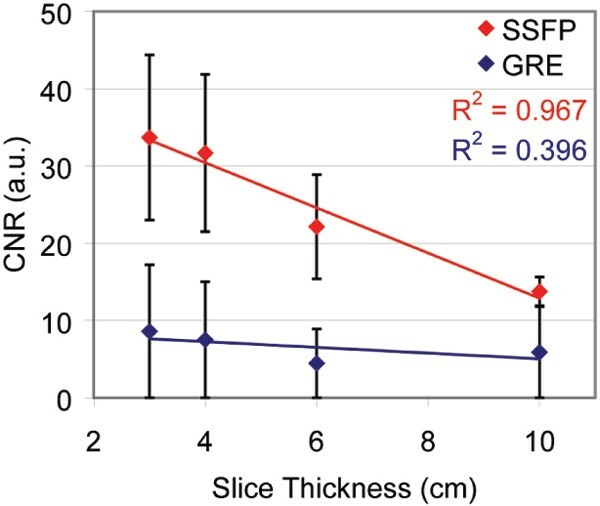 Note that the GRE has a lower baseline contrast that SSFP, though at 10 cm slab thickness, SSFP has lost significantly more contrast. GRE loses contrast linearly up ~6.5 cm slab thicknesses, after which contrast reaches a minimum. In this study, we sought to quantify the inflow effects in single phase 3D cardiac imaging as would be used for the study of coronary arteries and veins. Our methodology shows that there are 60% and 75% reductions in blood-myocardium CNR associated with increasing the acquisition slab thickness from 3.0 cm to 10 cm with SSFP and GRE, respectively. These losses in SNR and CNR will reduce the effective SNR gains expected when increasing the number of z-partitions.